Tomorrow morning, I board a plane to head to the city where I grew up — Buffalo, NY. Why? My 20 year high school reunion. Eek!! Good lord, how has it been 20 years? I have been out of high school two years longer than the age I was when I left it. A bit surreal. 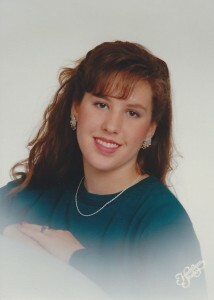 Senior portrait, taken summer of 1992. I think I was wearing Lee Press-On Nails. I also had clearly not been introduced to tweezers, given the state of my eyebrows. I know there are people who still retain bitterness and anger and hatred towards the high school years or people they went to school with. I couldn’t imagine, 20 years later, still caring about anything that happened in high school or retaining any kind of grudge. Sure, it was four formative years of my life. But I’ve had plenty of more significant years since then. I’ll be in Buffalo for less than 48 hours, meeting up with people from my past (who incredibly are now also a part of my present). For those I was close with — as well as for those I won’t for the life of me remember — I am glad for the chance to raise a toast, to be glad that they are well, to acknowledge our shared journey through the halls of our schools. So back I will go. For better or for worse, 20 years later, I will once again join with the class of 1993. And to think, this time we can actually use our real IDs to buy alcohol!! This entry was posted in ... Normal and tagged Aging, Friendship, Home, Travel, Youth by Laura. Bookmark the permalink.